Précis: The great majority of individuals with Parkinson’s reveal no genetic mutations, no past history of head injury, no prior exposure to pesticides/toxins, or any family history of the disorder. Public health studies have consistently shown that advanced age is an adverse risk factor for developing Parkinson’s. The average age of Parkinson’s onset is ~60 years of age. Presented here is a brief overview about why advanced age is a major risk factor for Parkinson’s. Parkinson’s and advanced age as a risk factor: Parkinson’s is a neurodegenerative disorder that affects movement. It starts slowly, usually a small tremor or stiffness in a hand. With time, Parkinson’s progresses; typically characterized by motor symptoms such as slowness of movement (bradykinesia) with rigidity, resting tremor (Parkinsonian tremor), balance and walking problems, and difficulty swallowing and talking. Parkinson’s has several non-motor symptoms including anxiety, depression, and insomnia (just to mention a few). Following Alzheimer’s, Parkinson’s is the second most common neurodegenerative disorder affecting ~0.3% of the developed world population. Interestingly, the incidence of Parkinson’s increases to 3% for persons >65 years old, which strongly indicates that advanced age is a major risk factor for this disorder. Aging can promote several detrimental events that damage the dopamine-producing neurons in the substantia nigra. These pathological events accumulate and weakens the ability of these neurons to respond to further insults, which ultimately leads to Parkinson’s (see below). 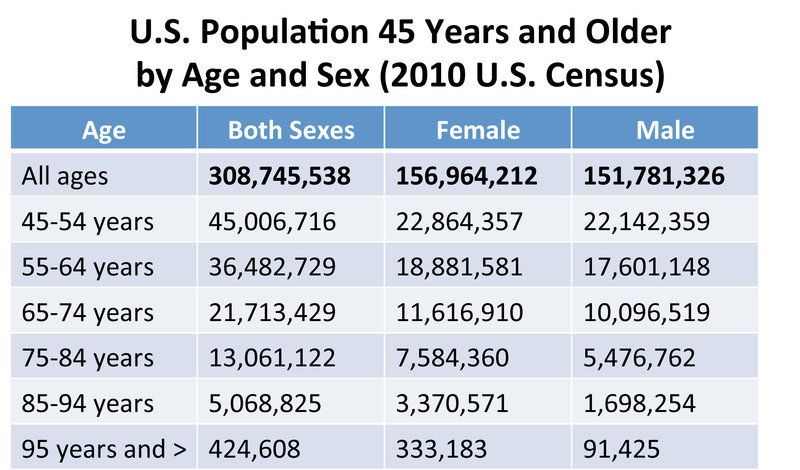 Age of the U.S. population: Andy Rooney once said “It’s paradoxical that the idea of living a long life appeals to everyone, but the idea of getting old doesn’t appeal to anyone.” As the table below shows, by each successive decade of life, females outlive males. However, between 2000 and 2010, the U.S. male population grew at a slightly faster rate than the female population. By contrast, mortality rates in older men differ from older women, where the census results showed that women tend to live longer than men. A further breakdown shows the 65 to 69 year old age group grew by 30%; this age group represents the leading edge of the Baby Boomers who started turning 65 in 2011 (The Baby Boom includes people born from mid-1946 to 1964). We are living longer; when coupled with advanced age as a risk factor for Parkinson’s, this implies an increasing burden on health care systems to deal with this disorder. Science behind advanced age as an adverse risk factor for Parkinson’s: Pat Benatar said this about aging, “I’ve enjoyed every age I’ve been, and each has had its own individual merit. Every laugh line, every scar, is a badge I wear to show I’ve been present, the inner rings of my personal tree trunk that I display proudly for all to see. Nowadays, I don’t want a “perfect” face and body; I want to wear the life I’ve lived.” Advanced age contributes to many different diseases whether from a loss of organ function with time, diminished immune surveillance capacity, or the inability to remove naturally-accumulating toxic substances by the host defense mechanisms (just to describe a few of many possible outcomes of advancing age). In evaluating a large group of elderly people without Parkinson’s (750 individuals with an average age of 88.5 years), it was noted that ~1/3 showed mild to severe substantia nigra neuronal cell loss. Thus, natural advanced aging results in some loss to the dopamine-producing substantia nigra mid-brain region. But what shifts the balance that leads to Parkinson’s in some individuals? Reeve et al. (2014), in an outstanding article, reviewed the science behind why advancing age is the biggest risk factor for Parkinson’s. 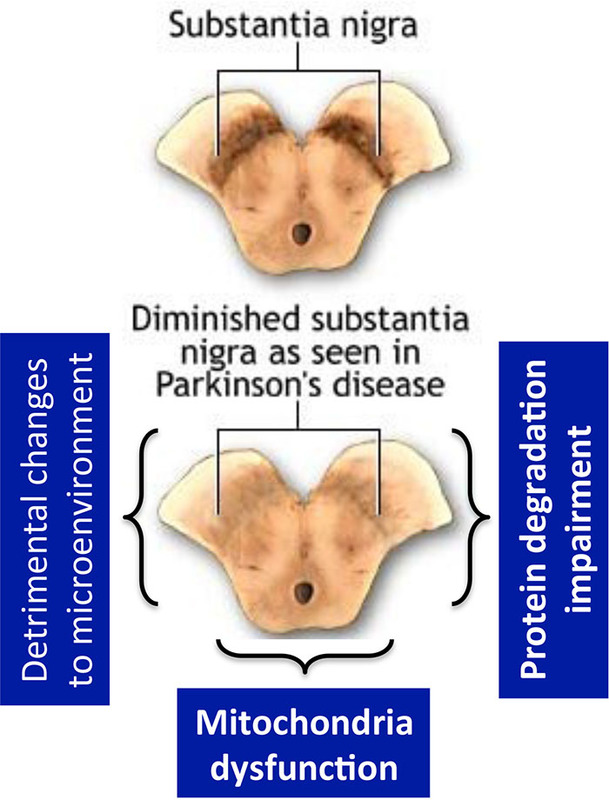 They suggest three processes occur in the substantia nigra that ultimately leads to Parkinson’s: (1) detrimental changes to the microenvironment; (2) dysfunction of the subcellular organelles called mitochondria; and (3) disruption in the process of protein degradation (the drawing below highlights these processes). (1) Detrimental changes to the substantia nigra microenvironment: As an analogy, over time, with extended use and re-use, your laptop slows down and ultimately begins little processor-derived-hiccups-of-dysfunction. As we age, some changes occur in the dopamine-producing neurons of the substantia nigra; these include increased oxidative stress, changes in calcium-neuron properties, modification of iron-neuron interactions, and accumulation of the pigment called neuromelanin. Processing of dopamine in the substantia nigra generates detrimental oxidative stress; which is made worse due to an age-related reduction of a protein named the dopamine transporter (DAT). The DAT escorts dopamine from neuron-to-neuron to reduce oxidative stress. Calcium helps maintain dopamine levels; and sustained transport of calcium into the cell is detrimental to the energy-producing organelle, the mitochondria. Iron is an essential element; however with age, iron accumulates to contribute to the oxidative stress. Neuromelanin is responsible for the color of the substantia nigra. Evidently, neuromelanin accumulates with age; in contrast to the other factors mentioned above, neuromelanin may be neuroprotective. (2) Dysfunction of the subcellular organelles called mitochondria: As an analogy, over time, you charge the battery of many devices like your cell phone, laptop/tablet, toothbrush, and beard trimmer; eventually no matter what you do, slowly but surely these devices lose their charge. Likewise, mitochondria are subcellular power factories that can become dysfunctional (and lose energy) with advancing age. The mitochondrial respiratory system (electron transport) is a major cellular energy producer; and it consists of five protein complexes named respiratory complexes I–V. Several mitochondria electron transport complexes are modified/inhibited with age, leading to a loss of mitochondria-derived energy. Inhibiting complex I (reduced NADH dehydrogenase–ubiquinone oxidoreductase) causes Parkinsonian-like symptoms; furthermore loss of complex IV (cytochrome c oxidase) promotes a respiratory deficiency. This leads to the reduction of energy production (ATP molecules), which would negatively impact “neuronal excitability” (engaging/activating the neuron). Linked to this energy drain is mutation of mitochondria DNA, causing further detriment to these dopamine-producing neurons. These mutations ultimately reduce mitochondria function and activity, which promotes the accumulation of mis-folded proteins (a very bad thing). A key disease-causing feature of Parkinson’s is the build-up and denaturation of the protein named alpha-synuclein (think of the changes of frying an egg, which goes from clear to cloudy-opaque as the heat cooks and denatures the egg proteins). Accumulation of alpha-synuclein protein aggregates advances further mitochondria impairment. (3) Disruption in the process of protein degradation: As an analogy, shaving with a new razor blade leads to complete cutting-off of the hair; however, over time, as the razor blade dulls you end-up with more and more uncut hair. Similarly, we use enzymes called proteases and they are somewhat like a razor blade; their goal is to cut-up (digest) proteins. Proteases are used in many different biological settings (e.g., digestion of food, clotting of blood); in the substantia nigra, proteases help eliminate protein debris as a means of self-renewal of the neurons. There are two types of protease processes that cut and remove accumulating damaged proteins (like alpha-synuclein aggregates); they are named the ubiquitin proteasome system and autophagy. Due to their complex biology, neither the ubiquitin proteasome system nor autophagy will be further described here; suffice it to say that if both protease systems are diminished this will further impair mitochondria. These checks-and-balances are lost with advanced aging, which leads to a concert of adverse events where an individual could develop Parkinson’s. A symphony combining (1) + (2) + (3) from above + advancing age = risk of developing Parkinson’s: The natural-biology of dopamine-producing neurons leads to declining function with advanced aging. The detrimental process of reactive oxygen species initiates a symphony of badness that leads to neuronal cell dysfunction/death. The larghetto first movement leads to the reduction of the DAT, accumulation of neuromelanin, increased iron deposits, and disruption of calcium transport. The next movement is fortissimo with mutation of mitochondria DNA, inhibition of complex I and complex IV to reduce both ATP levels and neuronal excitability; these events lead to the acquisition of other mitochondria defects. The cadenza results in the beginning phase of aggregating alpha-synuclein, which contributes to substantia nigra dysfunction. In the final movement of our symphony, we reach a crescendo where toxic levels of aggregating alpha-synuclein accumulate that cannot be cut/removed by the protein degradation pathways. The symphony ends with substantial stress to the dopamine-producing neurons in the substantia nigra to eventually promote neuronal cell death, which results in Parkinson’s. With advancing age, most individuals will stop at the end of the first movement (microenvironment changes to substantia nigra); while others will complete the entire symphony over-and-over again to develop Parkinson’s. Reeve, A., et al, Ageing and Parkinson’s disease: Why is advancing age the biggest risk factor?, Ageing Research Reviews, Volume 14, March 2014, Pages 19-30, http://dx.doi.org/10.1016/j.arr.2014.01.004. Abdullah, R., et al., Parkinson’s disease and age: The obvious but largely unexplored link, Experimental Gerontology, Volume 68, August 2015, Pages 33-38, http://dx.doi.org/10.1016/j.exger.2014.09.014. Petralia, R.S. , et al., Communication breakdown: The impact of ageing on synapse structure, Ageing Research Reviews, Volume 14, March 2014, Pages 31-42, http://dx.doi.org/10.1016/j.arr.2014.01.003. 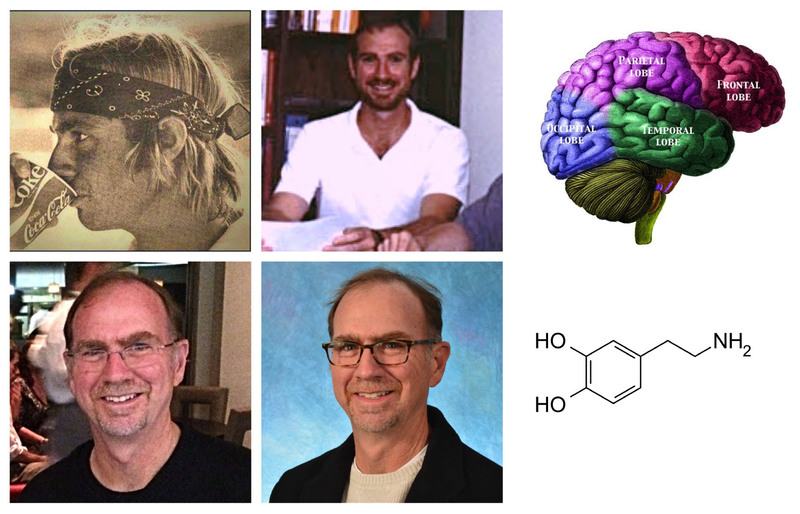 Aging, Alpha-synuclein, Blog, Central Nervous System (CNS), Dopamine, Education, Happiness, Health, Health and Healing, Mitochrondria, Parkinson's, Parkinson's Disease, Risk factor, What causes Parkinson's?